In this post are pictures of some of the samples used in the Diamonds Are A Girl's Best Friend workshop presented at the 2009 N.S. Fibre Arts Festival in Amherst, Nova Scotia. The class was more than just the sewing of one project; it was a day of "thinking outside the diamond." It requires the sewing of 6 "Y" seams to complete the project - enough to give mastery of the seam, yet not enough to overwhelm. I demonstrated 3 different ways participants may choose to sew the Y seam. It has the added bonus of strip-piecing log cabin blocks, which require repeated trimming on a 60 degree angle. Repetition helps us retain what we've learned. I brought along samples of my Seven Sisters pattern which uses smaller diamond stars, pieced in log cabins, pinwheels, and plain fabrics. After we had mastered the rotary cutting, we then examined various ways one-patch diamonds could be used in a project, and addressed the tricky issue of off-setting the patches when joining the diamonds. We looked at how to stack fabric to strip-piece, cut, and sew one patch diamond blocks. No class on diamonds would be complete without a nod to the topic of isometric perspective where diamonds are used to give the illusion of depth and dimension. 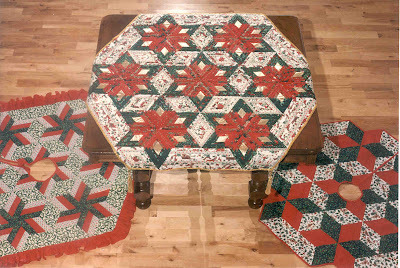 It surprised many to realize that the quilt below is basically the same as our log cabin star workshop project. It uses the same number of blocks, and the same number of strips on each log cabin block. Can you see how easily our star morphed into these boxes? I sewed several samples showing how the placement of light, medium and dark values causes our eyes to tumble the blocks. This is a favourite traditional design which our grandmothers often used. From there, citing Karen Combs as reference, I showed some fun things which could be done with diamonds. You will notice many of these pieces are unfinished. Here are some diamonds joined in an Attic Windows setting: The same Attic Windows set was used in this second example, but I reversed the width of the centres and sashing strips. The effect is quite different: The same diamond is used for the top of this "vase": Of course you cannot talk about 60 degree diamonds without also including companion geometric shapes of equilateral triangles, hexagons, and half hexagons, which share a common angle. Grandmother's Flower Garden is a well-known traditional pattern composed of hexagons. My sample for this pattern was done in black and white, and sewn into a cushion which resembles a soccer ball (you can picture this one yourself- just visualize a soccer ball.) 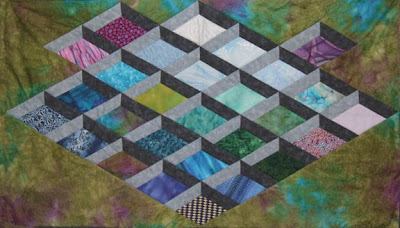 It was a piece I had designed for Quick & Easy Quilting a few years back when I was writing a column for that magazine. 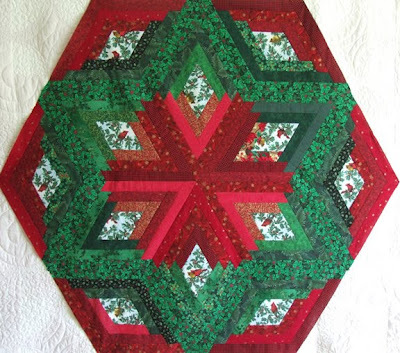 Hexagon blocks were joined by hand in the past, but are easily and quickly sewn by machine. This sample was pieced in honey shades to look like the comb our bees spin in wax on their foundations: The "Inner City" block, composed of half-hexagons, was my favourite to sew and is a terrific use of scraps. When I packed up the samples to take to the workshop, I did a rough count of the "Y" seams which I had sewn to produce them. It came to just under 500 "Y" seams. I was quick to point out to the participants that there was to be no whining about sewing 6 for their project! 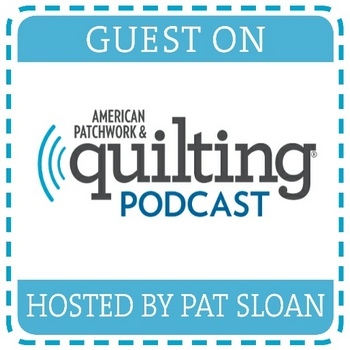 This workshop was organized and hosted by the Cumberland Quilt Guild. It was originally scheduled to run one day, but it filled quickly and the waiting list was long enough that we added a second class. In the end, both classes were over-filled, as we squeezed as many in as the room would hold. It was wonderful to have so many enthusiastic quilters gathered - as quilters, we grow so much within ourselves in such a coming together. I hope the attendees left with their heads weighted down with diamonds. Plans are already underway for next year's N.S. Fibre Arts Festival. 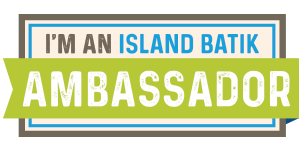 If you have ideas or any comments to share, please visit the festival website to find contact information. For those who joined us in class, I welcome feedback and sincerely look forward to seeing pictures of your finished pieces. Yesterday was the final presentation of the Fibre Arts Festival "Diamonds Are A Girl's Best Friend". The day got off to a great start with this surprise gift of selvedges! These came from Joan who joined us from Saulnierville, N.S. This was the first time I had met Joan in person, although we have been enjoying each other's blogs for some time now. You can visit Joan's blog here (but give her time to get home to post about her visit to Amherst - that's a long drive!) Joan's sister Simone is also a quilter and she travelled from Antigonish to join Joan for the Fibre Arts Festival . We had a fabulous day of sewing together. The Ralston Room of First Baptist Church was pretty much at capacity, and the air was filled with the hum of machines...or at least it was until we overloaded the circuits and lost power on the right side of the room! That issue was very quickly remedied. However, apparently the competitive bunch of quilters on the left side of the room took it as a challenge and stepped up their production, thus blowing out the left side of the room as well...over, and over and over again! The clever caretaker solved the problem once and for all, and work resumed uninterrupted from that point forward. It was a wonderful, eclectic group of both new and seasoned quilters from around the Maritimes. Peter, from Mahone Bay, is fairly new to quilting but rotary cut the 60 degree angles like a veteran. It's always fun to see fabric choices, and Brenda - another from Antigonish - wowed us with these. We are all looking forward to seeing Brenda's finished piece. Upstairs, the Cumberland Quilt Guild had a magnificent showing of quilts hung in the sanctuary. Throughout the day visitors to that exhibit dropped in to see our progress. Included among those was Sharon who came to show us her finished top from Wednesday's workshop. Isn't it gorgeous? That's Sharon's hand you see at the top, and Patricia from Sackville on the right. Later I will post some pictures of the samples I sewed for the workshop. Today is the final day of festivities, and I will be at Dayle's Department Store from 2-4 pm with a display of quilts. If you are in the area, please drop in to say hi. Today I was able to view several of the Fibre Art exhibits around Amherst. My first stop was at the Home Furniture Store on Lawrence Street, where quilts by Bobbins & Baymist Quilters were on display. There were also a great many hooked pieces there by Vera and Trina McInnis. Next, I crossed over to Dayle's Department Store to catch Vera demonstrating her exquisite crazy-quilting. Here she is ruching a length of ribbon which she will use to embellish one of the squares on her quilt. All of Vera's work is meticulously done by hand. There are lots of fibre enthusiasts in town this week and Vera was attracting quite a crowd of onlookers interested in seeing her work. They were all beautiful, but if I had to pick a favourite...it would be this fan quilt. The contrast in colours and sharp crispness of the blades appeal to my eye. I also spotted "Farrago" hanging high-up in the fabric department. Tomorrow after my last workshop is finished, I plan to take in the quilt shows at both the Baptist and Anglican Churches and then the Zonta Bazaar at Tantramar Theatre. There is so much to see around town and I don't want to miss any of it! Here's today's group hard at work in the Ralston Room of the First Baptist Church of Amherst. It's a great space, and it was so terrific to work with such an eager, enthusiastic group. They even paid rapt attention to the application of Pythagoras' C2 -B2 = A 2 theory on finding the height of an equilateral triangle. Well...maybe not "rapt" attention... but that glazed look in Sharon's eyes had a certain politeness about it. That counts. Mary from Montreal, one of the class participants, surprised me with a very thoughtful gift she had made just for me. Not only is this set of table mats stitched from selvedges, they are sewn around a centre of bee print fabric. Aren't they lovely? I am touched by her thoughtfulness, to say the least, although I suspect that Mary makes a habit of doing kind and thoughtful things. I first met Mary last evening at the Festival's opening reception. She had a display on Victoria's Quilts Canada (VQC), a national non-profit organization which provides home-made quilts to comfort folks with cancer. 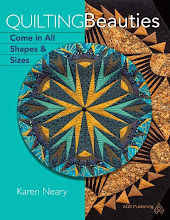 Mary is spreading the word on VQC, hoping to encourage local quilters to establish a VQC branch in N.S. Mary's mats are pictured here with a gift from another quilter; Janet saw this bee skep and honey dipper last year and immediately thought of me. Day one of the NS Fibre Arts Festival is over and what a day it was - more like 2 or 3 rolled into one! Early this afternoon I attended a mini-workshop with Laurie Swim, where she demonstrated some of the techniques she uses in her work. We each had opportunity to work on three different samples and they were all a lot of fun. Knit & Stitch from New Minas supplied Janome sewing machines; it was wonderful not to have to lug a machine. The opening reception this evening at Tantramar Theatre on Victoria Street was lovely. There were several displays set up, words of welcome from town dignitaries and the Fibre Arts Festival committee, as well as tons of food and refreshments. There was a good crowd in attendance, including these lovely ladies who are gearing up for the Diamonds workshop. And speaking of Diamonds...the piece they are examining contains 24 diamond shaped blocks. This is "Farrago": an assortment or a medley; a conglomeration; a confused mixture. Well named, don't you think? It is pieced from a fabric line designed by Mark Lipinski named Krakow. 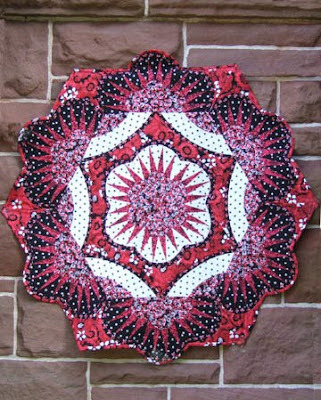 Dayle's ordered it in especially for the Festival and my quilt was designed to showcase the dramatic red and black prints. The pattern is available for $12.95 ; something new this time are packages of pre-printed tear-away paper foundations at a cost of $8.00 for 24 foundations, which is enough to complete the quilt. Farrago measures 41-1/2" across, and makes a stunning accent on a wall or table; it's an eye-popper! Pattern and foundations are available from Dayle's or directly from me. The checkout page on my website has not been updated as yet to include the patter, but if you would like to order online let me know and I can email an invoice where you can pay with a credit card. Farrago is shown here photographed against the quarry stones of the First Baptist Church in Amherst, where the diamond workshops will be held...the first in a very few short hours. The schedule for this very busy week is posted on the Festival website. For me, today will include the final packing up for the workshops and attending a session with amazing quilter Laurie Swim this afternoon. It will be a thrill to see her beautiful works of art in person. After that is set-up for the first workshop and the display for tonight's signing of Canadian Heritage Quilting at the official opening reception. This will be held at Tantramar Theatre from 7-8:30. At this display, I will unveil the new piece I designed with the special fabric which Dayle's Department Store brought in just for the Festival. No hints, except to say it's a wild one! I'll show you tomorrow, when the piece goes on display at Dayle's for the duration of the Festival. Hope to see you tonight! After a few whirlwind weeks of preparing for the Fibre Arts Festival, it was wonderful to stop this weekend and reconnect with family and friends and all the things that make our lives worthwhile. Part of our travels to be with family took us through the beautiful Wentworth Valley in Nova Scotia, an area renowned for its spectacular displays of fall foliage. Every Thanksgiving weekend, the chair lift at Ski Wentworth operates to allow visitors access to the top of the hill, a terrific vantage point for viewing fall leaves. The parking lot was full and the cars were lined back to the road. Lots of oranges and yellows, but not many deep reds as yet. Those will come soon enough. Further along on the Shore Road in Masstown, we visited a pumpkin U-Pick operation. Nothing says "Thanksgiving" like pumpkins, and they dotted this field as far as the eye could see. I gave a special word of thanks for not dropping the pumpkin pie this year...which I have done twice in the past. I'd like to think the jinx is broken, but I will continue to make two for the annual dinner... just in case. Never hurts to have back-up.